The sessions start at 7.30 pm and finish at 9.30, with a break for supper between the two sessions and a chance for informal conversations with the presenters and each other. and others The Uluru Makarrata Statement – the long journey to it and from now on. How do we create a Future where everyone owns all of Australia’s history and culture? Group discussion with various resource people. Aboriginal people in the Media, past and current challenges and changes. 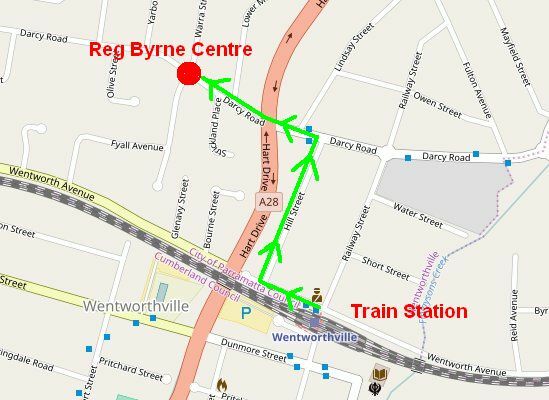 Ample parking available at the Reg Byrne Centre. Take the right-hand exit from the station. Left on Wentworth St, Right on Hill St.
Left on Darcy Rd, cross Cumberland Hwy. Follow Darcy Rd to Fyall Ave.
We encourage you to register with the Parramatta Evening College on 9687 2072 or via their web page since this helps with preparation and catering. You can turn up to any or better all of the sessions that build on each other. Building Bridges provides an opportunity to come and hear Indigenous and a few non-Indigenous presenters sharing their experience, knowledge and expertise in an informal and relaxed atmosphere. Here’s your chance to meet and learn directly from and with Aboriginal people and discover that there’s more to Indigenous society and culture than is portrayed in most media. change to achieve a just future society for all. It depends on us, the people, to address the causes of the gaps and stand up for what is needed for full recognition, partnership and equality. Governments won’t move unless we the people demand it. It’s time to listen to and learn from Aboriginal people themselves and deepen the dialogue. Together we can accept and acknowledge the truth and enable dignity and healing for all. Chris Tobin, a Darug man from Western Sydney, one of the traditional custodians for this part of the country. Chris is an Aboriginal Discovery Ranger with National Parks and a workshop leader. Pam Gow, a Kamilaroi woman, a long term nurse with NSW Health in Western Sydney. and trainer in Aboriginal cultural awareness and appropriateness of service delivery. Joanne Tuscano, former teacher and full-time writer on Indigenous issues and co-author of Back on the Block and This is Where You Have to Go. Christine Palmer, a respected Warlpiri elder, therapist, indigenous support worker and trainer, was a member of NT women’s advisory council and various youth justice advisory committees. Mail, a passionate advocate for changing systems that subvert Indigenous rights. for Treaty and First Nations Worker Alliance. study of the astronomy of the East Coast saltwater people. sharing the wonders of the universe and complex knowledge of Indigenous Australian Astronomy. Lola Forester, a Yuibera woman from Qld, host of the news and current affairs program of Koori Radio (Blackchat) and commentator on relevant issues.